Thermo Fisher Scientific offers an unmatched portfolio of analytical, process control and measurement technologies to the mining industry. We offer solutions from belt scales and weigh feeders to laboratory and on-line analysers, and we are the world’s leading producer of portable X-ray fluorescence (XRF) analysers for elemental analysis. From the superior performance of our Thermo Scientific™ Niton™ FXL field X-ray lab to our handheld Thermo Scientific™ Niton™ XL2 and XL3 Series, these analysers can be operated virtually anywhere on-site, providing advanced in-situ geochemical analysis in seconds. This maximises efficiency across all stages of mining, from early-stage exploration to mine operations and mineral processing. Portable XRF analyser models that feature our geometrically optimised large drift detector (GOLDD™) technology, provide faster measurement times and lower detection limits – up to ten times faster than conventional Si-PIN detectors and up to three times more precise than conventional smaller silicon drift detectors (SDD). For measuring samples of unknown chemical composition, in which concentrations of light and heavy elements may vary from parts per million (ppm) to high percent levels, these portable XRF analysers feature fundamental parameters (FP) calibration to simultaneously compensate for a wide variety of geometric effects, X-ray absorption, and secondary and tertiary fluorescent effects. Using this universal calibration, the analyser can be used easily with minimal training because it measures the full range of element concentrations in a wide variety of samples without any additional calibrations or user input. Quickly obtaining accurate exploration assay data to guide mining operations is one of the biggest obstacles to optimal productivity. Thermo Scientific portable XRF analysers provide fast acquisition of this data for rapid delineation of ore boundaries and the in-depth, quantitative geochemical analysis of metal concentrations for mine mapping. Lead times are reduced, which can also be of critical importance if the regional exploration season is short. Our XRF analysers allow for analysis capabilities to be brought to the field, avoiding off-site or remote laboratory turn-around delays and costs. The ability to rapidly acquire and send XRF data to quarry, laboratory and operations management personnel allows for easy collaboration and informed decisions. Traditional laboratory-grade sample analysis is transformed to be fast and simple. Samples can be tested on site with little or no sample preparation. Accurate analyses are provided in near real-time for process control, quality assurance and other operational decisions. Our XRF analysers are the instrument of choice for in-quarry exploration and evaluating the composition of raw materials such as phosphate, potash, gypsum and limestone for industrial use. 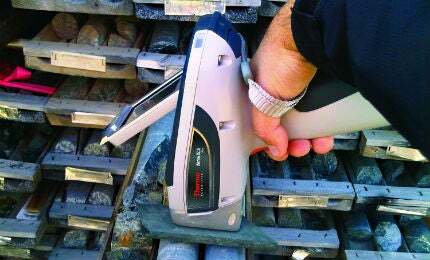 Thermo Scientific portable XRF analysers are valuable for upstream exploration and production, offering rapid, on-site chemical analysis of rocks, cuttings and cores that can be used for identifying formations and inferring the mineral composition of the strata. Users can also infer other properties favourable to oil and gas production from data collected in real-time such as porosity, permeability, fracture population, general chemostratigraphy and reservoir characterisation and the presence of TOC and oil-bearing strata. The rugged Niton FXL field X-ray lab with the Thermo Scientific™ z-CAL is ideal for light element and trace metal analysis required for gas shale applications. Thermo Fisher Scientific Inc., the world leader in serving science, today introduced embedded GPS functionality in all Thermo Scientific Niton XL3t Series x-ray fluorescence (XRF) analyzers. Download the free brochure for more information, and to read how the tools complement Thermo Scientific portable XRF analyzers, to generate analytical data in minutes. Thermo Fischer Scientific's portable XRF analysers are lightweight and field-ready. Field personnel in oil & gas exploration and production (E&P) can now generate fast, reliable elemental composition information with the Thermo Scientific Niton Field X-ray Lab (FXL) equipped with the new Thermo Scientific z-CAL, a fit-for-purpose calibration and operation methodology for light elemental analysis. Thermo Fisher Scientific Inc., the world leader in serving science, today introduced the Thermo Scientific Ultra Performance Packages for improved light element analysis.